When the next legislature meets it might undertake to end some of the confusing contradictions which keep the work of the Central and Southern Flood Control District in turmoil. The confusions continue while the cost of the project originally estimated at $200 million reaches toward $400 million with an additional $100 million in prospect. There are 18 counties in the district, yet only five are represented on the governing board. Members are appointed, not elected, but have the right to levy up to 1 mil tax in the district. No two members may come from the same county, which means that were two especially able men available from one of the counties, the services of one would not be available. Since the district was established in 1949 a controlling majority of the board has come from approximately the middle section of the district: this because the work was Lake Okeechobee related in public and official thinking when the law was adopted. The way it worked out is that five unpaid men, who meet once a month exercise enormous power on a project about which they cannot have the knowledge which comes with day by day application. Of the present members one manages his own investments at Kissimmee, one is a real estate operator at Melbourne, one is a agriculturist at South Bay, one is a Chevrolet dealer at Ft Pierce, and the fifth Robert L Searle, former mayor of Coral Gables is an insurance man. OUT OF THIS situation, and understandably, has grown a policy hitched primarily to soil reclamation and farm land controls in the general lake area. Other factors which were endorsed by Congress when Uncle Sam set up the project on approximately an 80 (federal) to 20 (state) percent participating basis were secondary such as the fresh water resources of the East Coast cities, the Everglades National Park, the National Wildlife Refuge in the upper sector and the states fish and wildlife area approximately in the middle area. The purpose of the district would be better served if the public interests involved made its policies known through membership on the board. Out of mutual understanding could come better administrators. It might too end some confusion in the public mind. 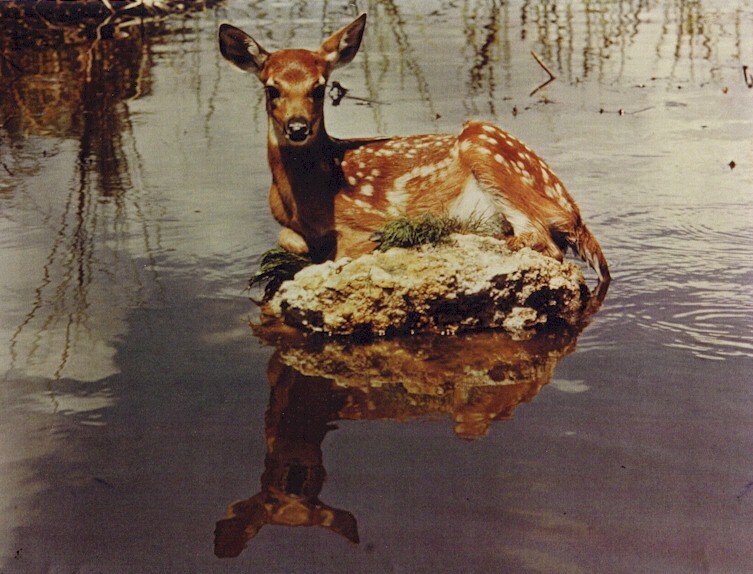 The recent controversial water-threatened fawn pictures suggested to many that the Everglades Park drought situation had been solved. The pictures were made far north of the park, in some of the water that the park is being deprived of by the complication of man-made controls in the way of its southward flow.